Tony Campos graduated from the University of California at Santa Barbara with a BA in economics and then earned his MBA from Golden Gate University in San Francisco. For all that it may be worth, he did graduate from high school with high honor. It all turned into a whole lot of years of pumping education into the brain. Here is what he has to say about it all. That's right! I have a lot of school education. I actually place more importance on my high school and graduate learning than I do on my college experience. College is one big fantasy world of ideas fostered by a bunch of professors that are totally out of the real world. Unfortunately, the high school system has now become just as unreal as the college system. When I went to school, we learned to interpret what we read, and then we learned to justify what we wrote. That is what I stand for and believe in. There must be a sense of reasoning and logic whether we turn out right or wrong on the issue. Why am I a conservative in my beliefs. I am conservative because I believe in the reasoning and logic which backs up this belief. This directly relates to economics, education and social values. Do I believe in change? Not when the change involves the trashing of any element of the Constitution of the United States by those with political power that are afflicted with a mental disorder. The Constitution of the United States is the soul of our nation, and I am dedicated to defending the Constitution from all enemies foreign and domestic. Trying to change the Consititution should be considered an assault. I do fear that our greatest enemy is in actuality an enemy from within. The enemy may not even be at the gates. The enemy may already be within our walls in the form of a home built Trojan Horse. This is my book which is newly revised with copyright 2012. I stand by this book against anyone that may believe that human nature not relevant. 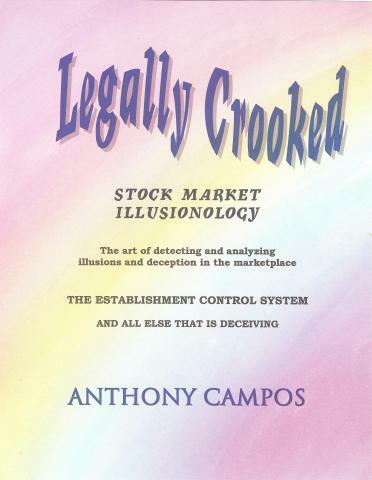 To many people in politics and business, being legally crooked is a solution. Anthony Campos also holds a PhD accredited from Northcental University.